I recently had to perform a system update for a SAP ECC 6.0 EHP6 from SP04 level to SP21 level and the tolerable downtime for the involved SAP system was concentrated during a weekend, so losing time between different procedure phases was not admissible. I performed in the past many SAP system updates and an important need was a frequent check of the user interface of the SUM, in order to take an action as fast as possible. Some important phases are long-running, so it was uncomfortable to continue to access to a PC for a continuous check. How could I simplify this important check? I remembered reading something about a tool offered by SUM, the SUM MailNotifier, and I decided to try to use it during my update. 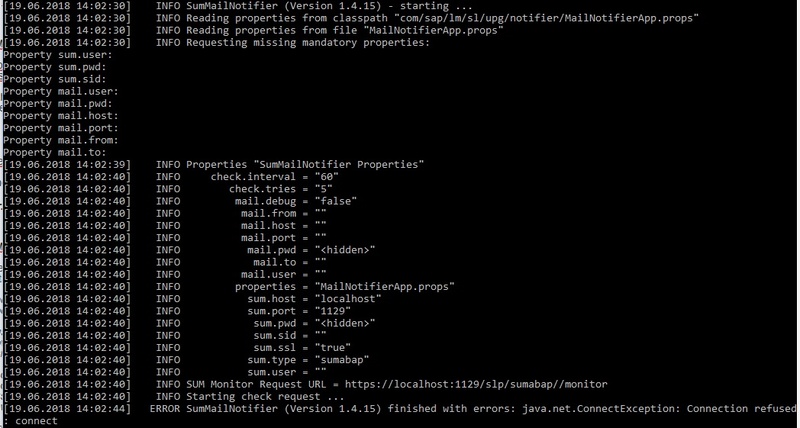 As reported into the SUM Upgrade Guide the MailNotifier is a Java-based tool that notifies you by means of an e-mail when the Software Update Manager (SUM) waits in a dialog for a user action. I copied these files from the Application Server where SUM was running to my PC directory. I noticed that some parameters were requested, so I evaluated the needed modification for the MailNotifierApp.props file. I didn’t modify the check interval (a check every 60 secons) and check tries parameters. I started the tool again…….now it works fine! As soon as SumMailNotifier starts a mail arrives and notified me that SumMailNotifier has been started. MAIL SumMailNotifier requires action- SPAU is ready! A mail notified me that the update procedure is ready for the SPAU, so I can immediately ask the ABAP developers to start with their activities. In my opinion this easy tool is very useful during an upgrade/update, because you do not have to check the user interface of the SUM frequently, which is especially helpful during long-running upgrade/update phases.